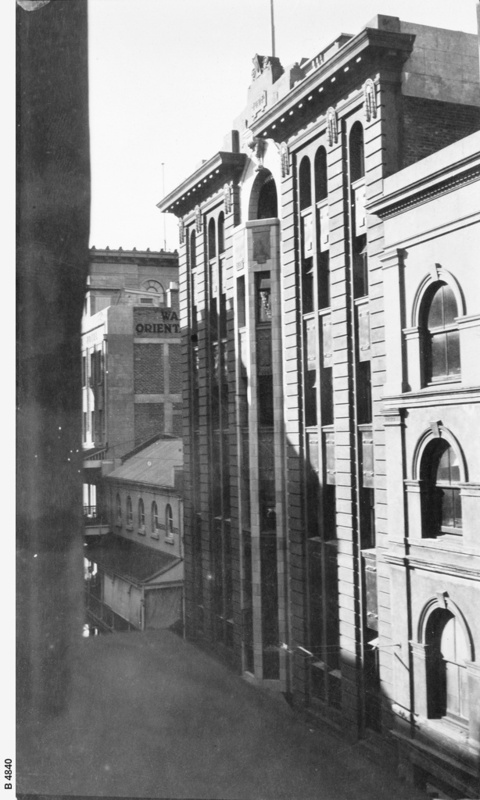 [General description] Three quarters view of Claridge House taken from a high place on the opposite side of Gawler Place. See B 4839 for information re architect and builder. [On back of photograph] 'Gawler Place, east side / Claridge House / 1 May 1928 / Claridge House erected in 1926-7 / Compare with B 3319 / For other photographs of Claridge House see B 4839 and B 4712 / Site of Claridge House : Far side is 33 yards south of Rundle Street / Frontage : 20 1/2 yards'.